Generally credited with obtaining the first powered, controllable flight in human history, the Wright Brothers (Orville and Wilbur) actually lived and worked in Ohio. They chose the Kitty Hawk, North Carolina area as it was the closest location to Ohio that fulfilled their needs for gentle breezes, soft sandy landing areas and a level of privacy from reporters not offered elsewhere. The First Flight Gold Proof Coin is struck from 90% gold to a diameter of 27mm. Surcharges were added to the sale of each of these coins and forwarded to the First Flight Centennial Foundation. The Foundation was to use the funds for the Wright Monument on the Outer Banks in North Carolina and the Wright Brothers’ National Memorial Park. Each First Flight Gold Coin is struck from 90% gold to the diameter of 27 mm. 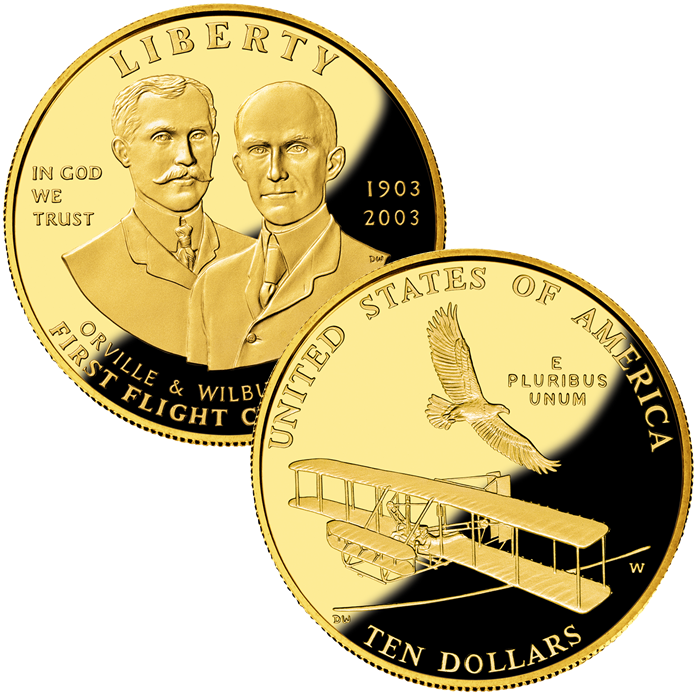 The US Mint released the First Flight Gold Coin on August 1, 2003. Initial price on the First Flight Proof Gold Coin was $350.00. 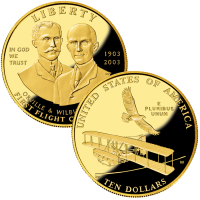 Designed by United States Mint sculptor/engraver Donna Weaver, the obverse (heads side) of the First Flight Gold Coin shows a portrait of Orville and Wilbur Wright. The reverse (tails side) was also designed by United States Mint sculptor/engraver Donna Weaver and features an image of the Wright 1903 Flyer.